My mind is clearer here. The morning dew gives a fresh earthy scent as you breathe it in. Open your eyes to the wide vistas of emerald green seas of grass blowing in the crisp wind at your face. The odd puffy white clouds covering the ground from here and there. A chill running deep inside from the brisk cold air as I step outside from the warmth of my Ger. 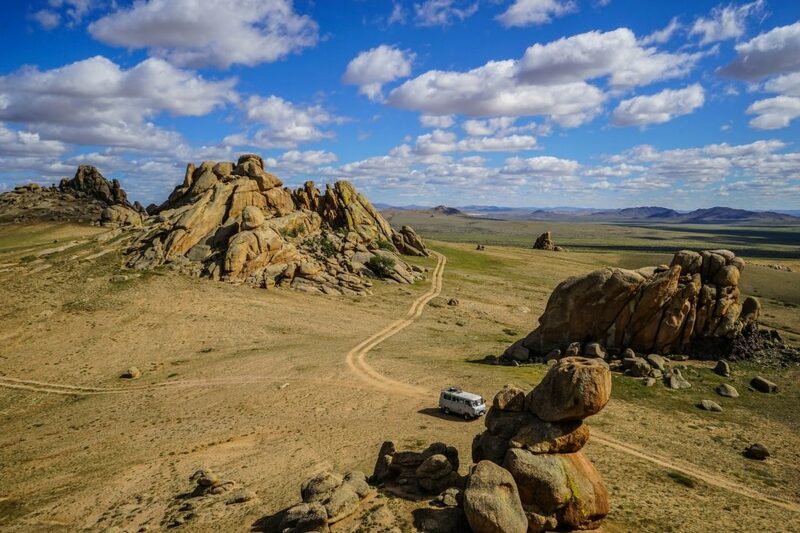 Central Mongolia is what dreams are made of. There is something special in the air here. Something no word in any of my stories can tell. The story starts in Ulaanbaatar the capital city of Mongolia. In a less than appealing hostel, in an even lesser appealing restaurant serving me and my two friend’s bits and pieces of goat meat in what looks to be pasta. My travel companions Adam, and Jacob, are two friends of mine from back in Canada who met up with me here for this leg of the journey. The leg that so far has become quite frustrating due to the lack of information on our intended region of travel in Mongolia. Lunch finished; we head to our hostel to meet and interview a driver who is willing to take us on our journey. 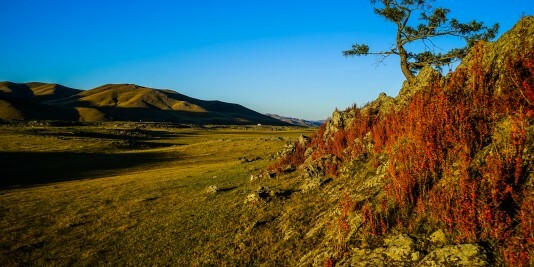 Our route is unusual for travelers in Mongolia. We intend on traveling through the centre and heart of Mongolia, and down through the Gobi. After the Gobi we are not stopping like most travelers do. 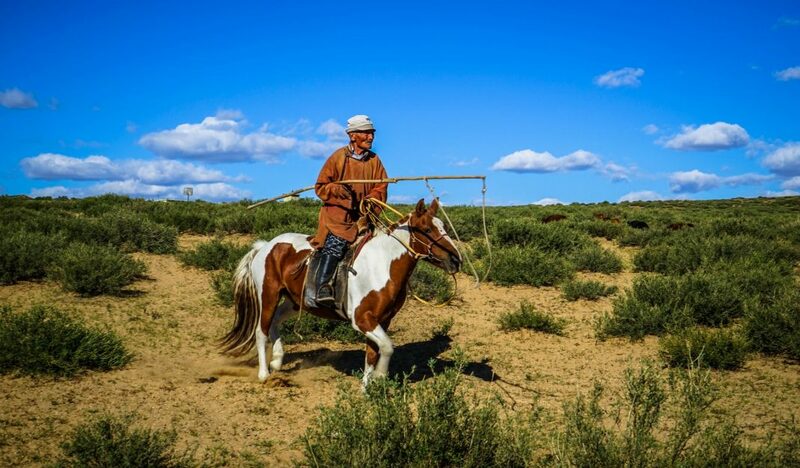 We will push on through a region west of the Gobi that very few dare to go. Crossing the Gobi we will head to Western Mongolia through the Altai Mountains and some of the most remote corners of our planet. We have no gear. I mean no sleeping bag, no jackets, no camping gear and no guide. 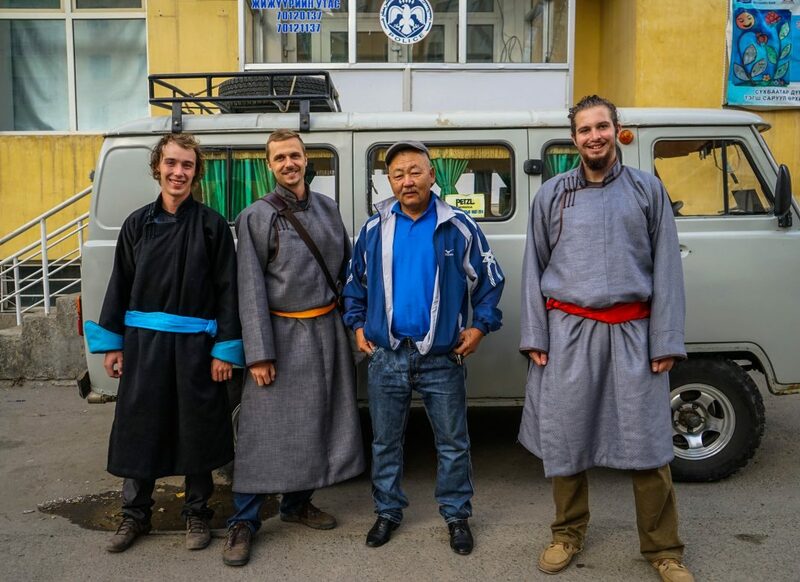 The plan is to travel Mongolia as the Mongolian nomads do. Jackets will be replaced with the Mongolian Del. 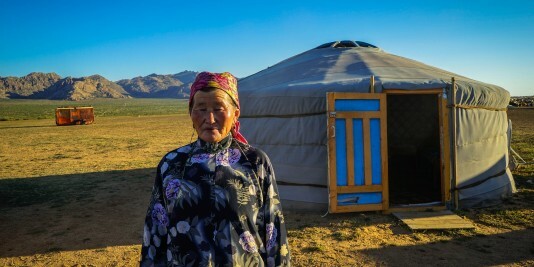 Instead of tents we will stay in Ger’s with Mongol Nomads. As for food, we will do as the Nomads do, eat when we find food from other Nomads. I am here to have the REAL Mongolian experience. 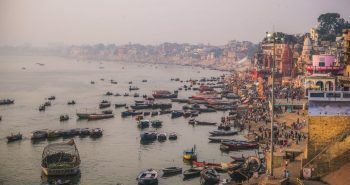 Suffering from letting go of all western comforts is a part of travel learning, and I will do exactly this. 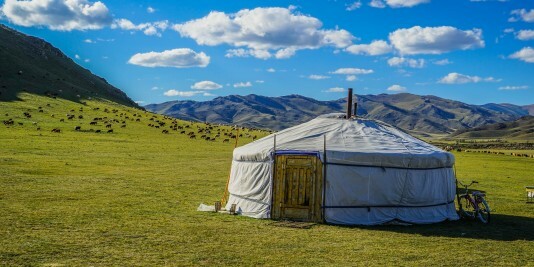 GER – A Mongolian style nomadic tent that is easily packed up and moved. 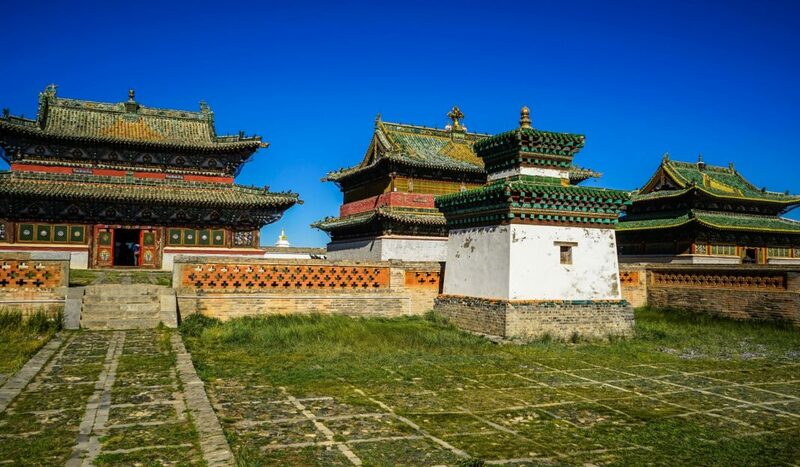 Mongols favour this as there home of choice because of the ease to move to new pastures during different seasons for their animals. Also known as a YURT in Central Asia. Upon arriving to the hostel we are introduced to Juga. Juga a fifty some year old strong Mongolian man who makes his living taking travelers to far out locations in Mongolia. 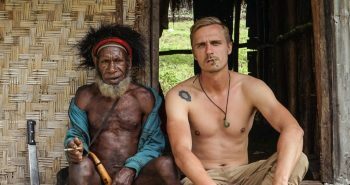 The deep creases on Juga’s face show his experience, his eyes are piercing, and don’t look away when we tell him of the challenge we want to travel. 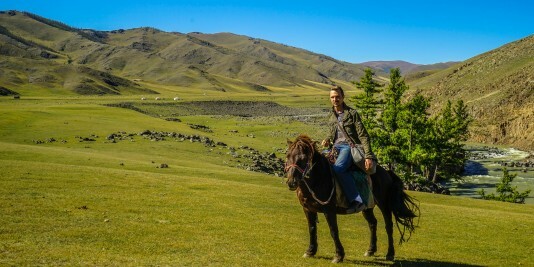 His deep knowledge of Mongolia to remote areas is evident in his confidence. Juga is the driver we need. After some Genghis vodka, and good laughs we agree on the route, and head off to the market to gather supplies. Naran Tuul black market is a sight itself in Ulaanbaatar. 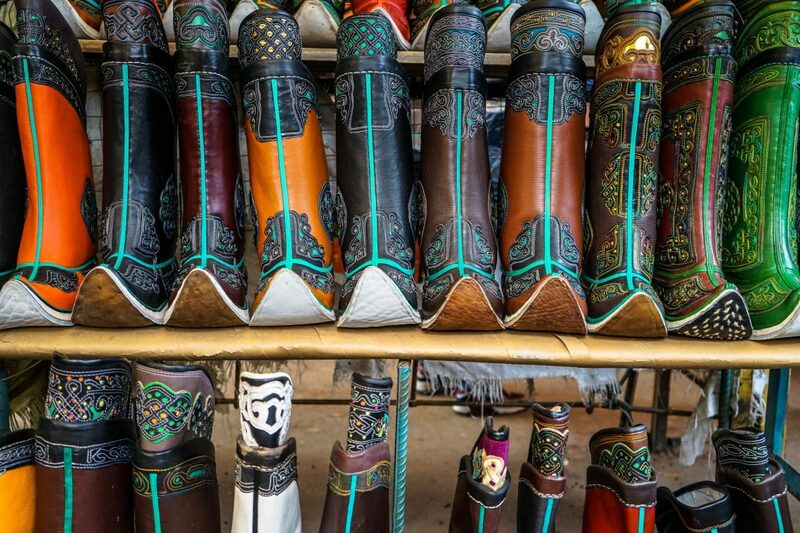 You can find almost anything you can imagine here from camel saddles to Mongolian style cowboy boots, and some other shady products. We are here to purchase the Mongolian Del. Everywhere in Mongolia you will see people wearing this traditional coat. It’s long, thick and a perfect combatant for Mongolia’s harsh climate. We managed to get our Del’s after some comical bargaining for 30 us dollars each. 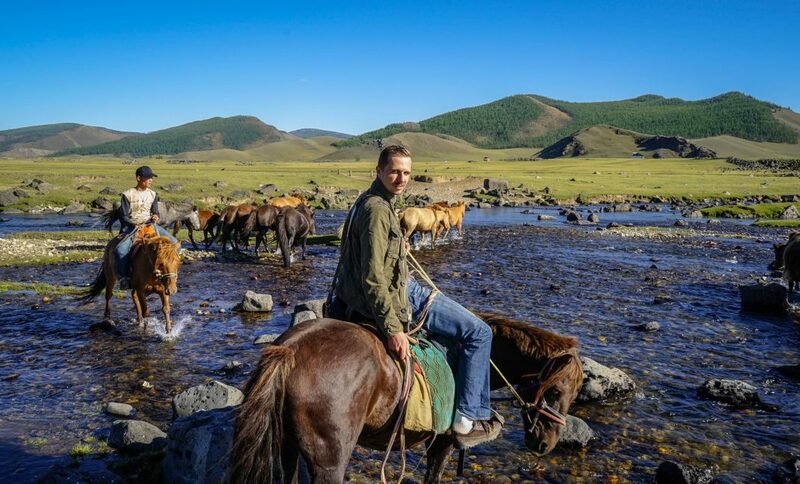 Equipped with our Del’s, and a quick stop at the local market for a few road snacks, and we were off into the vast emptiness of the Mongolian countryside. The city disappears fast from sight and the realities of Mongolia become very apparent, very fast. Only rolling hills populated with the odd nomadic Ger, and flocks of sheep are seen every so often. In the distance a large mound of rocks appears, with blue and green material intertwined in its mass. “The shamans leave this for us, we have to circle it three times, and throw three rocks into it for safe passage”, Juga exclaims. Juga pulled the van over so we could perform this ritual. The shaman rock pile gives off an eccentric energy as you circle its mysterious core. Like hearing whispers from the past it lures you to it, it speaks to you. We kept driving for countless hours. The green rolling hills pass by like waves outside a ship. The puffy white clouds patching the vast blue sky. Juga grunting and coughing from his fortieth cigarette. The journey was long, but relaxing. We made few stops at Nomadic Ger camps to stretch our legs and sample some Arak: the local horse milk fermented alcohol. Arak tastes like fizzy sour milk. It tends to be made in a large blue cylinder tub that is churned with a primitive wooden stick. To get the fresh ingredient you must milk a horse.. It’s just as strange of an experience as it sounds. The desert near Chuluuns Ger. Eventually after some time the dazzling jade grasslands began to change into a desert panorama with enormous bizarrely shaped boulders strewn across the barren black stone hills. This landscape almost has a Martian feel to it with all the golden yellow sand and the sun scorched black mountains. We arrived at our Ger camp which was owned by a local nomadic family who housed tourists in the few spare Ger’s they have. The man of this family was named Chuluun. Chuluun was an elderly fellow who proudly watched over his domain. He had hundreds of sheep, cows and a few camels hanging around his land. Although Chuluun was an elderly man he still climbed aboard his steed and herded his animals with no effort. Chuluun brought to our attention that we should walk down to the nearby lakeshore to see more of his land. The lakeshore was about a three kilometer walk past green pastures and tall yellow sand dunes. This land was odd looking, but incredibly beautiful. Chuluun riding to get his camels. At the lake side we heard drums beating. The deep bass of the drum lured us curious travelers to a remote corner of the lake where it was resonating from. Hidden in between an opening of the lake reeds was a memory that still today leaves me questioning everything I thought I knew in my life. “Hello who are you guys and why are you here?” A women says approaching us with a stern look. I was thrilled she spoke such great English. We explained to her that we are travelers and heard drum beats so we followed the noise. “Would you like to meet my Grandfather?” she then asked. We of course complied with the opportunity, and were led into a circle surrounded by strangely dressed figures. The head Figure of the group was crouched over his stool holding up a bowl filled with Vodka. His posture was sturdy and proud. His voice was deep and eerie; this was the Grandfather. 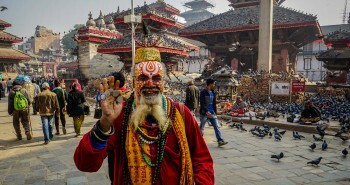 The Grandfather’s face was concealed with strands of colourful beads masking him with mystery. We asked the Grandfather for his blessings, and if it was all right that we were to stay here for some time. The Grandfather comically dumped the Vodka all over his face and grunted loudly while gesturing us to sit on the outside of the circle. The women we originally met at the beginning told us that her Grandfather was willing to tolerate with us observing the spectacle that was about to happen; but did not like speaking with foreigners who don’t understand his tongue. What happened next was unbelievable and marvelous! “My Grandfather is leaving now, I have to say goodbye, just sit where you are” exclaimed the woman as she kneeled before her Grandfather. Just then another Shaman man beating a drum hypnotically circled the Grandfather and sent him into a vigorous trance like seizure. The Grandfather stood up and took off his mask. To our surprise it was not her Grandfather at all. The Shaman grandfather figure had not even been a man! Instead the masked grandfather was a young girl about sixteen years old. “Do you believe in Shamans and magic?” the women asked us with a raised eyebrow. Unable to comprehend what we had just seen we only continued to stare at the younger girl with confusion. The women explained that they are all Shamans, and they were bringing people who have passed away years ago into the bodies of the living, so they can once again communicate with them and learn about the past. Her Grandfather who we had just talked to had just returned to what they call the “eternal blue sky”. The women told us we can stay and watch. We did exactly that. The Shamans proceeded to bring multiple other spirits back into people. We watched people who we had just been talking with, morph into completely different people. The Spirit inhabited people then lit a large fire, then had a ceremony with the water from the lake. Just to make this even more unbelievable we found out all the Shamans are blindfolded before they go into their trance. Blindfolded, the Shamans with the spirits poured themselves vodka, lit cigarettes and started a fire from scratch; how they did this I will never understand. I will never forget this experience, it was a truly magical experience that was a fluke accident we stumbled upon that I am so happy we did. 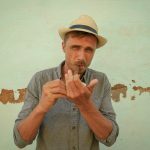 The Shamans gave us cigarettes which we were to smoke that evening when we returned back to the Ger. We did this back at the Ger camp with a beer and watched one of the most beautiful sunsets fall over the Mongolian horizon. This day will forever live as one of the most amazing travel days of my life. We woke to goats calling for feed, and the morning cold biting at our face. 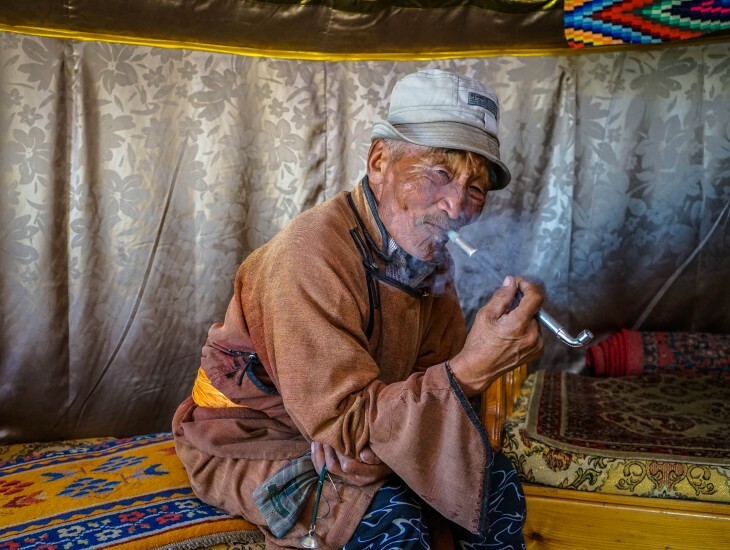 Crawling out of the Ger and stepping into Mongolia’s frigid mornings is a painful process. It’s manageable when you are greeted by Chuluun ushering you into the family Ger for breakfast although. After breakfast we said our goodbyes and were off on our Russian stallion made machine into the endless open landscape that lay ahead. Main monastery Erdene Zuu Khid. Leaving here our first stop would be Kharkhorin. 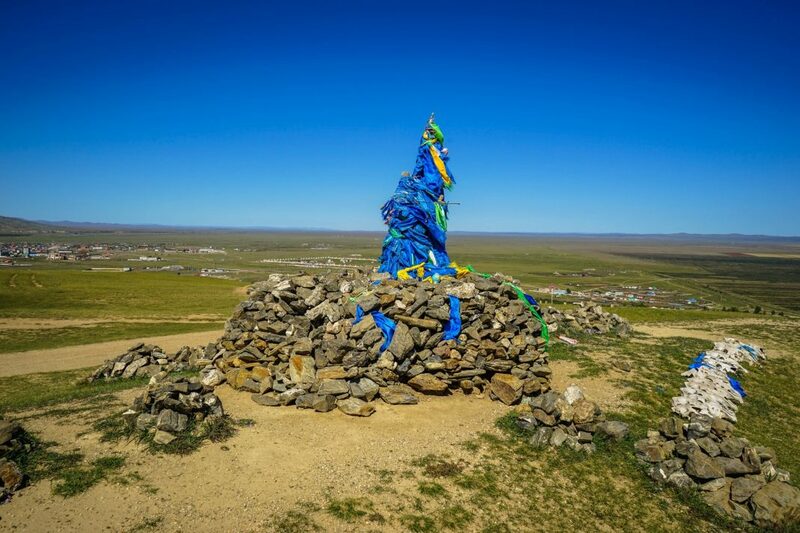 Kharkhorin is the ancient capital of the Mongolian empire ruled by the great Chinggis khaan. Not much is left of the glorious empire these days however. 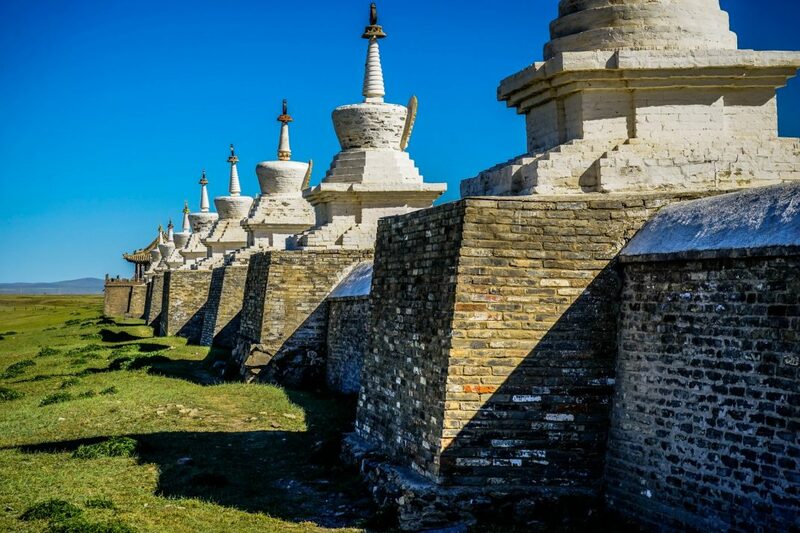 In the centre of town there is a massive Buddhist complex called Erdene Zuu Khid. 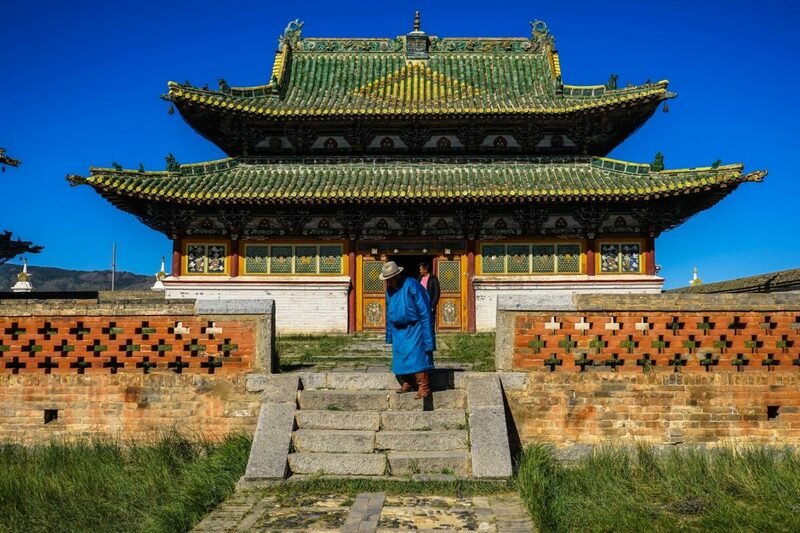 Founded in 1586 by Altai Khaan this is Mongolia’s first Buddhist monastery. During the Communist reign the monastery suffered much atrocities and damage. Walking through the complex you will discover lots of the relics and buildings around each corner that have either recovered or were not damaged at all from the communists. Walk under the tall white walls through the main gate and you are mesmerized by the queues of dark red robed monks chanting Buddhist prayers. 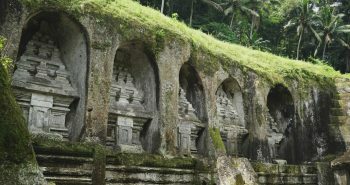 The air filled with the heavy waft of Juniper incense, the vibrations of the Tibetan gong, and the trumpets of Conch shells making a beautiful soundtrack. This Monastery is a sight not to be missed. Inside the monastery buildings are Thangka paintings of exquisite perfection that depict Buddhist tales of previous Lamas and Buddhist legends. 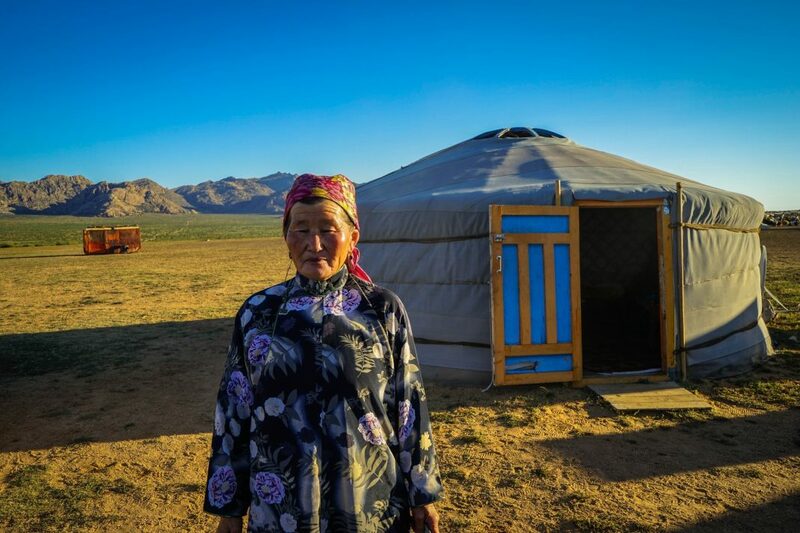 The welcoming feeling here is a great example of Mongolian hospitality. You can spend hours here just soaking it all in. Did you know? – In the west we know Chinggis Khaan as Genghis Khan. The correct pronunciation however is Chinggis. Nobody seems to know why we call him Genghis. Local dressed in traditional gear leaving Erdene Zuu Khid. 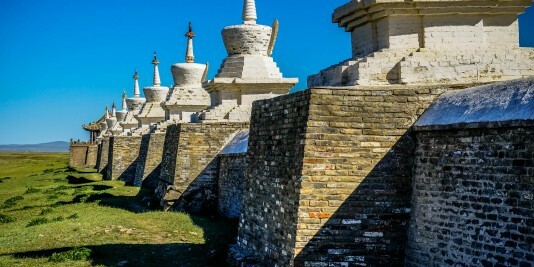 The walls to the Buddhist complex Erdene Zuu Khid. We left the monastery to gather more supplies for the road ahead. We also stopped for lunch which consisted of the delicious Mongolian Buuz (goat meat dumpling) and Russian style Goulash. Driving high above the town into the nearby hills the first thing you see is a large stone tortoise. This tortoise symbolizes the old boundary of Kharkhorin city. 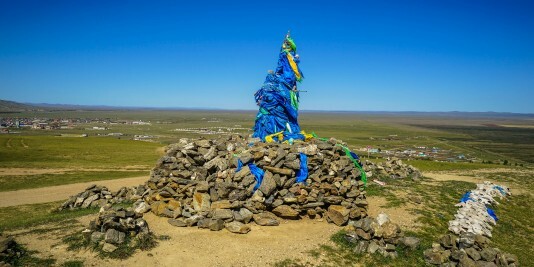 The boundary that the great Chinggis himself designated. The view of the valley below is absolutely spectacular from here. You will be amazed on how far your eyes can perceive here as the air is perfectly clear and the blue sky above illuminates the stark countryside. Driving through the hills and on, tall cedar trees began to emerge in the distance, and the hills grew into mountains with white peaks. The valley became steep, and an icy blue river below roared through the canyon. 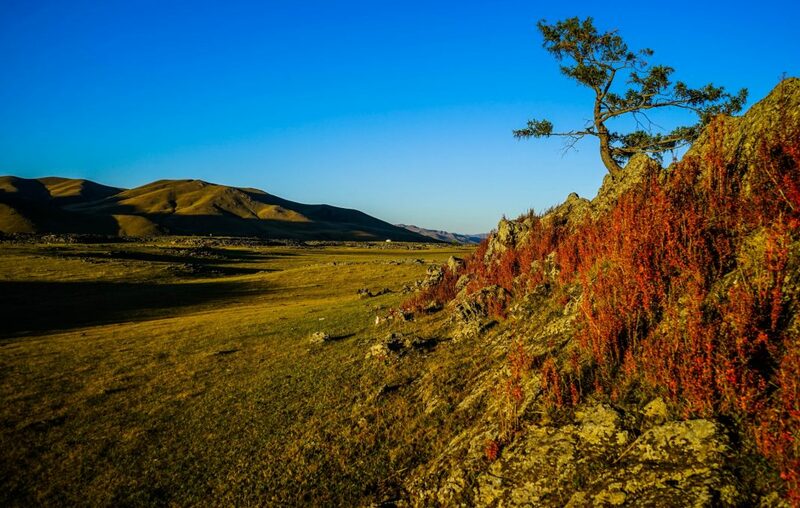 This is the Orkhon national park. The roads here become non-existent and you are left to navigate through the marsh lands which happened to be a daunting and difficult task. The Orkhon is relentless and getting lost here is not advisable as you are far from civilization. 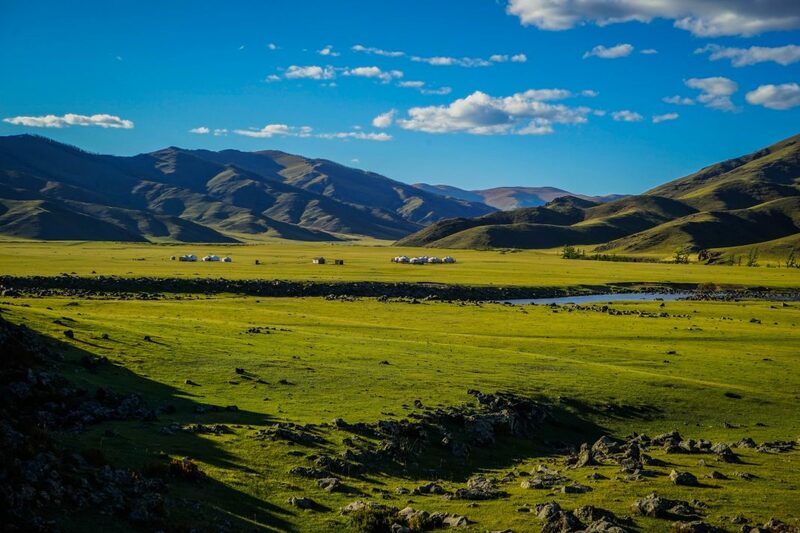 Staying here you must let go of any western comforts you have; there is nothing here for hotels or restaurants just pure raw amazing Mongolia. 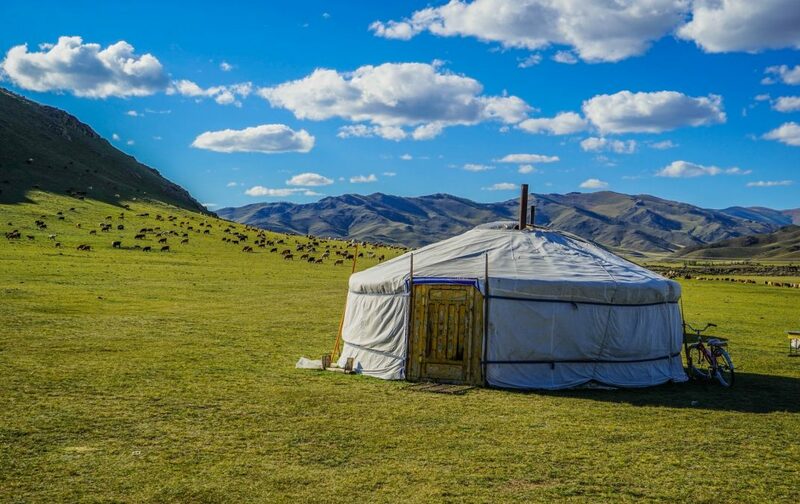 Mongolian Nomads live here during the summer and late fall for its animals to feed on the rich pastures. 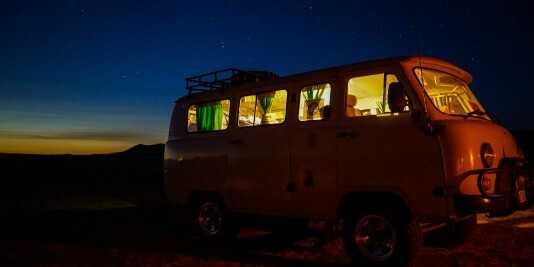 These Nomads also take in weary travelers so staying here you will be left to live the real Nomad experience. We arrived at our family nomad stay late at night, and were greeted with the ceremonial snuff bottle (tobacco you snort) and of course a bowl of Arak. The night here was cold, but brave the cold and go outside late in the evening, and you will see stars like nowhere else on this planet. So many stars that will leave you staring into the night sky for hours studying the new sky you never knew existed. Waking up here to the eternal blue sky and the Mongol steeds stomping the earth beside your Ger, and The scent of earth is refreshing. This place is natural; so natural that you are brought to a more primitive state of being you never thought you had inside you. As the morning cold is burnt away by the fiery orange rising sun we mounted our steeds. 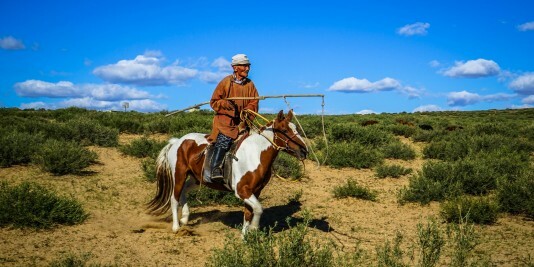 Mongolian horses are a testimony to this great nation. Strong, powerful and beautiful. 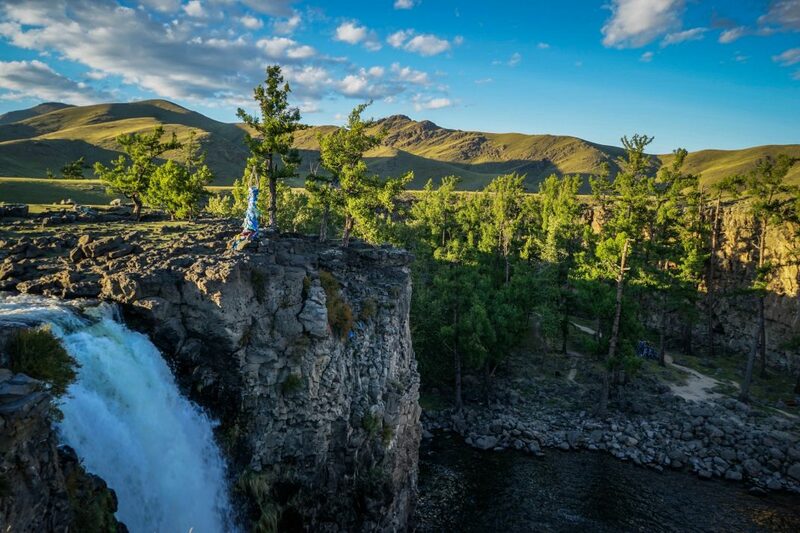 Mongolia’s largest waterfall Orkhon Khurkree. Equipped with our Mongol horses we ventured deep into Orkhan territory. Passing by the odd nomad Ger, and beautiful green vistas we arrived at Mongolia’s tallest waterfall Orkhon Khurkhree. The waterfall was a great place to let the horses drink and to freshen up in its frigid waters. After some time staring at Khurkhree’s stunning nature we pushed on further. 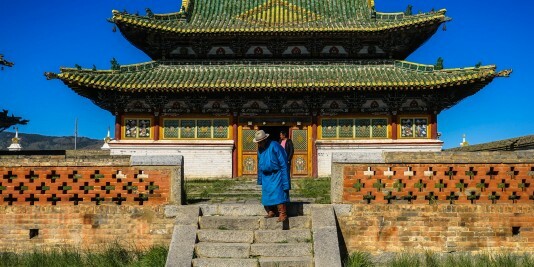 We were now enlightened by our Mongol host that we had come here in search for his yaks, goats and horses. We had been employed to help bring in the herd not knowing. Full of joy we three Canadian boys rode our steeds fast into the grasslands herding together all of our host’s animals. 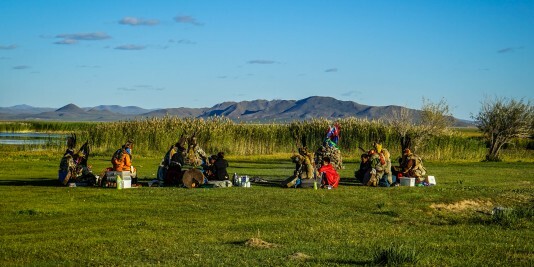 To become a Mongol nomad even just for one day was quite possibly the highlight of my entire trip in Mongolia. We rode until the sun began to set and brought in all the animals our host beckoned at us to get just in time for another family cooked meal inside the comforts of our warm Ger. Shaman mound high above the city Kharkhorin. The Orkhon is a travelers dream. Come here and be brought back to nature. Relearn what it is to get back to your primitive self. The Orkhon will make everything more clearly for you, a conscious cleanse of the mind. Bringing the Yaks back home. 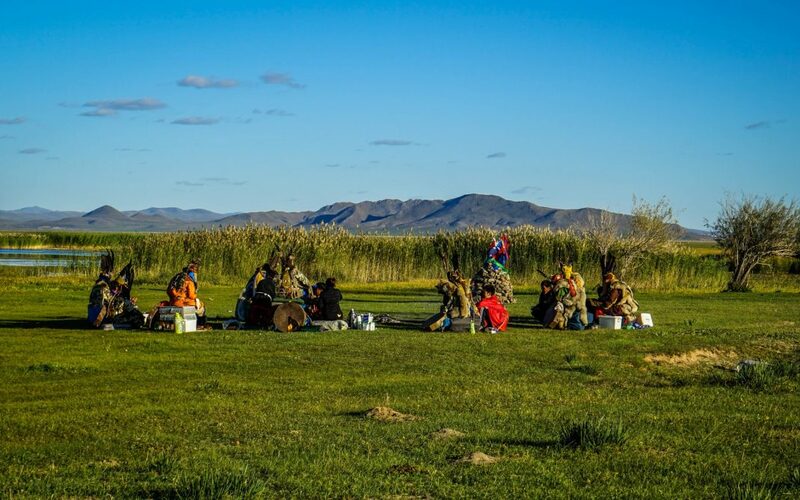 We spent three days more in this pristine valley learning the ways of the Mongol nomads. From the very people whose ancestors had once conquered the known world. We were only two weeks into Mongolia and had lots of more ground to be covered. Next stop the treacherous sands of the great Gobi desert! Tips: Find a driver who you really like, take him out for drinks and get to know him. You do not need to bring all your camping gear, Ger’s are very ideal, and the food the families make is good. Do not listen to other negative travelers here, there are plenty who will tell you “you cant go there” and, “you will die without a sleeping bag”. Bring snack, there is a lot of driving, and you will get tired of goat meat. 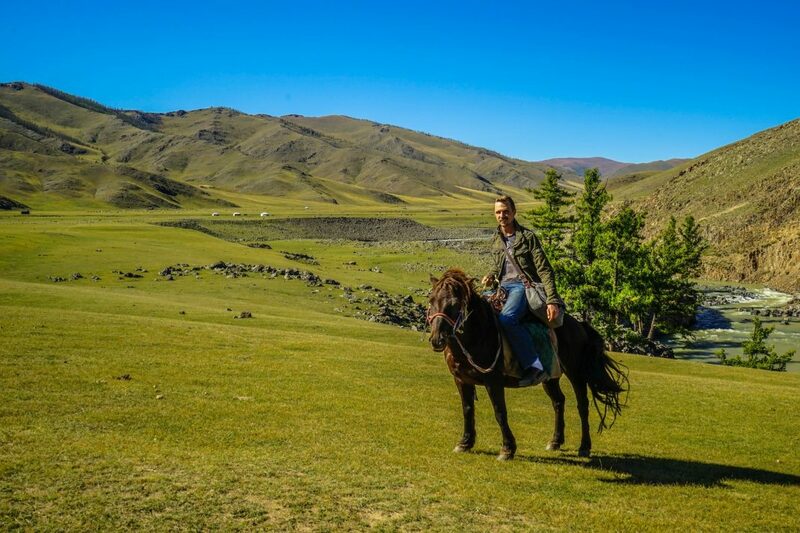 Interested in taking your own adventure in Mongolia? 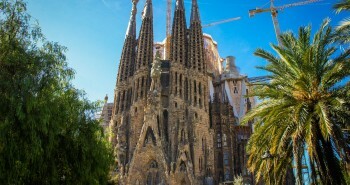 Have a look at the guided tours offered by G Adventures and help the blog at no extra cost to you. I like your blog; ‘know him’ instead of ‘no him’.